If you’re a fan of text-based adventure games, there’s a pretty good chance you’ve played one of Shu Takumi’s. As the creative genius behind the Ace Attorney series, Takumi’s inventive mysteries, witty characters and irreverent sense of humour have earned him a cult following (even outside of his native Japan). Ghost Trick: Phantom Detective is the designer’s attempt at something a little bit different, resulting a game that feels remarkably different to Ace Attorney whilst retaining the witty dialogue, lovable characters and involving mysteries fans have come to love. From the get-go, it’s clear that Ghost Trick possesses a far darker tone than that of the Ace Attorney series. Assassinated during the game’s exposition, lead character Sissel finds himself lying dead in a junk yard. Despite this, Sissel’s conscience remains active. With little idea who he is, or why he’s been killed, Sissel begins to wander around the junk yard looking for clues. Before long, Sissel begins to hear a voice in his head. This is the voice of Ray, a mysterious soul manifesting himself as a nearby desk lamp. Ray explains that Sissel possesses special powers called ‘ghosting’ and ‘tricks’; powers, he explains, that only a few spectres posses. Ghosting allows Sissel to possess inanimate objects (provided they are within Sissel’s limited reach), which enables him to move around the game’s beautiful environments. Guiding Sissel on the lower screen couldn’t be easier, and it’s simply a matter of following highlighted objects (such as discarded bottles, street signs and telephone lines) to get from A to B. Occasionally you’ll come across barriers that block your path, and this is where Sissel’s ‘tricks’ come in handy. Tricking allows Sissel to manipulate objects such as switches, levers and other interactive objects, providing alternate routes around the game environment. Sissel’s powers aren’t limited to terrifying Yvette Fielding, though. Should Sissel decide to possess and ‘trick’ a corpse (with the exception of his own), he can turn back clock to four minutes before their death occurred, giving him with ample time to change their fate. Doing so often provides Sissel with clues about his past and untimely death, but with only night remaining until his consciousness ceases to exist, he’ll have to make it snappy if he wishes to recover all of his lost memories. It’s an interesting tale, and one that contains absolutely no filler whatsoever. Everything in Ghost Trick’s world – from its eclectic array of environments, seemingly-insignificant characters and inanimate objects – plays a much larger part in the overall story than you’d think. Each of the game’s 18 chapters feels entirely necessary, and there’s no useless trinket designed to add artificial longevity to the proceedings here, either. Ghost Trick is essentially split between three modes of play: character interaction, exploration and puzzles. Puzzles begin as soon as Sissel finds a corpse, and involves going back in time four minutes before they died to try to manipulate events to avert their death. These sections prove to be Ghost Trick’s gamiest moments, and precise timing and concentration skills are paramount for success. One puzzle saw us manipulating objects to deactivate a mechanical death machine, whereas another had us averting the death of a young lady from a gigantic roast chicken (yes, you did read that right). Should you fail, Ghost Trick allows you to replay the entire puzzle, although it can be frustrating listening to dialogue you’ve already heard. 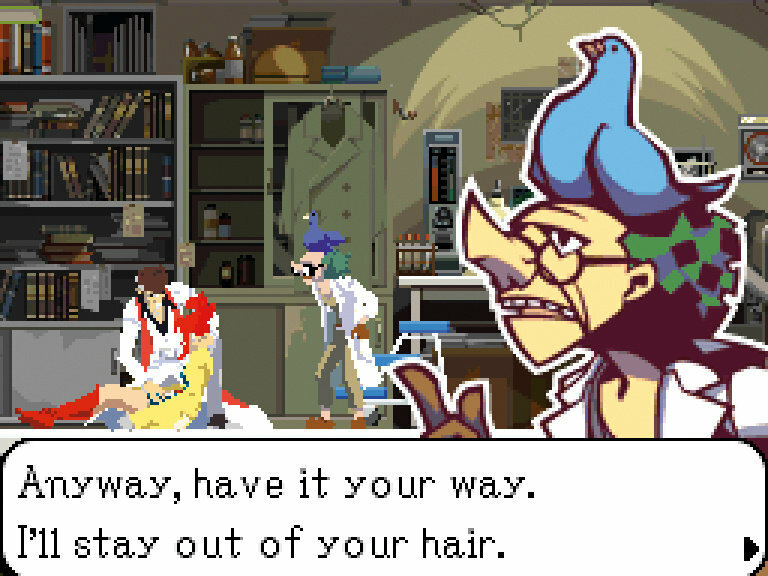 Even so, we hardly ever found ourselves rewinding time, as Ghost Trick does a great job informing players of what they’re supposed to be doing. Even so, we’d have preferred a ‘time slider’ that allows you to rewind time just before your mistake, as it’s usually obvious when you’ve messed up a puzzle. Of course, puzzles are only on half of the game – as anyone familiar with Ace Attorney will know. 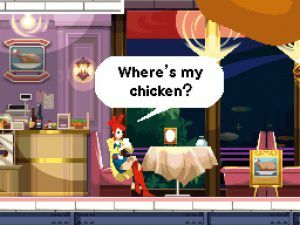 Character interaction makes up the other portion of Sissel’s paranormal adventure, and Capcom’s localisation team deserve a well-earned pat, having created a script that feels as though it was written natively in English. 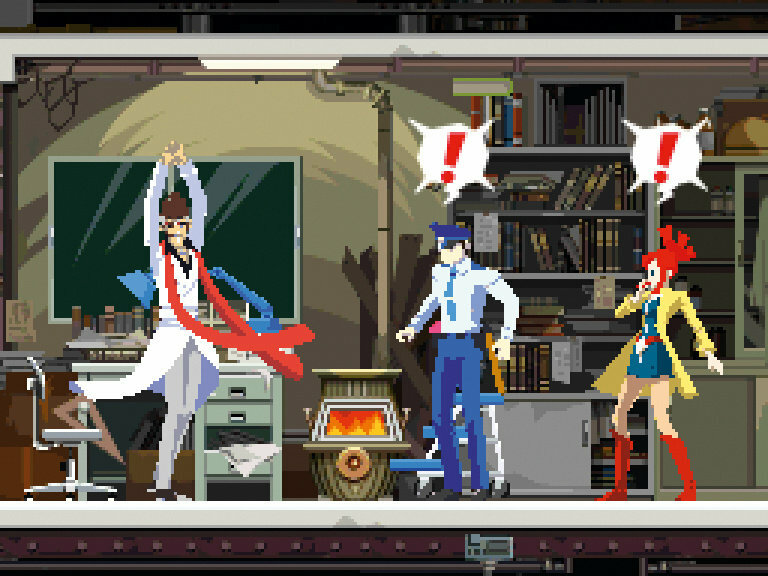 Whilst the nature of the game prevents characters from being quite as bombastic as Phoenix Wright and Co’, Ghost Trick’s characters are never less than engaging, articulate and witty. Ghost Trick also boasts one of the most beautiful art styles we’ve seen in years, especially on a handheld platform. Character animations are exquisite, breathing life into characters to such an extent you’d think they’d been mo-capped. The first time we clocked Inspector Cabanela’s ‘stairwell dance’ we almost fired our coffee out of our noses with glee. The animations are so believable that we’d happily trade our Nintendog for ebullient-pooch, Missile, any day. On the whole, Ghost Trick: Phantom Detective is a thoroughly enjoyable adventure, and it’s safe to say that Ace Attorney fans will feel right at home here. Some may find the game a little bit too repetitive for their liking, but even so, it’s a more interactive experience than Phoenix Wright’s courtroom drama. If you’re looking for a lengthy puzzle game that has an engrossing script, funny characters and a novel take on the genre, Ghost Trick: Phantom Detective is simply unmissable.